Fruit - light red, globose, 2 to 3 mm. in diameter, 16 to 20-seeded. Type locality - Near the city of Rio de Janeiro. 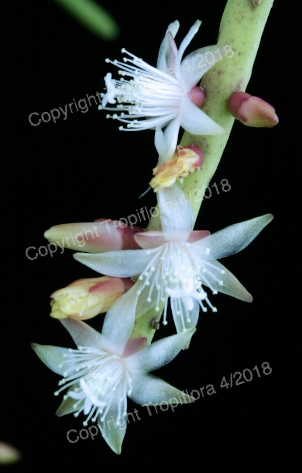 Three photos copyright and courtesy of Tropiflora Nursery, Sarasota, Fla., April 2018. DISTRIBUTION. Brazil (E Pernambuco, Sergipe, E Bahia, Minas Gerais, Espirito Santo, Rio de Janeiro, E Sao Paulo): epiphyte in high restinga, Atlantic, brejo and caatinga-agreste forest, near sea level to at least 900 m altitude. Notes from Bradleya 13 (1995): This species is difficult to distinguish from R. baccifera in the herbarium, but quite distinct as a living plant, its stem-segments not being regularly differentiated into long extension shoots and much shorter secondary segments, their indeterminate growth terminating without the formation of a composite areole. 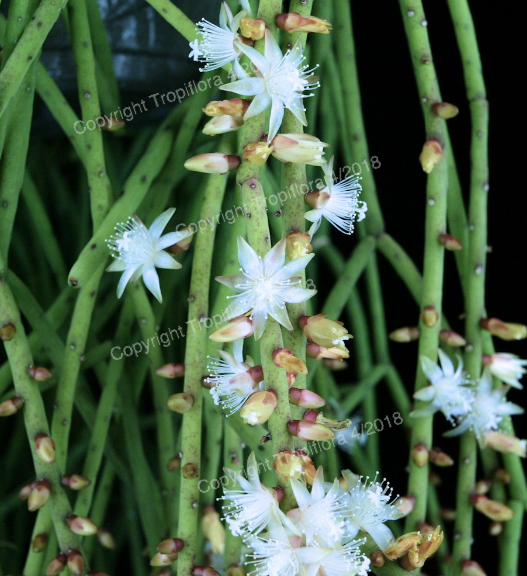 Unlike R. baccifera, the perianth of its flower is longer than the pericarpel and its fruits are generally smaller. Also, its stems are mostly thicker, becoming longitudinally ridged when dried for the herbarium. An exceptionally thick-stemmed form was described by Lofgren (1918) as R. densiareolata, but this appears to be connected to typical R. lindbergiana by intermediates and was soon synonymized by Britton & Rose (1923). 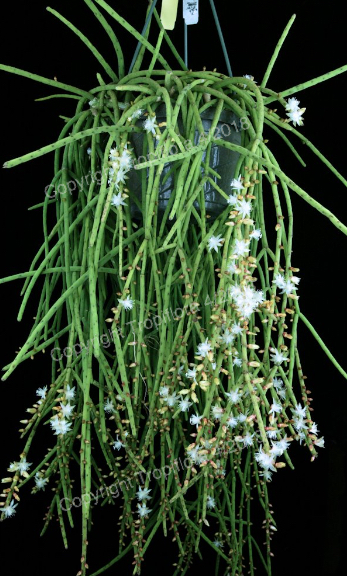 Although it has usually been misidentified as R. baccifera, this species is in fact the commonest Rhipsalis in and around the city of Rio de Janeiro and is particularly abundant in the Jardim Botanico, where it is sympatric with R. teres. From there it ranges northwards to at least Pernambuco, while its western limit appears to be close to the border between the states of Rio de Janeiro and Sao Paulo. 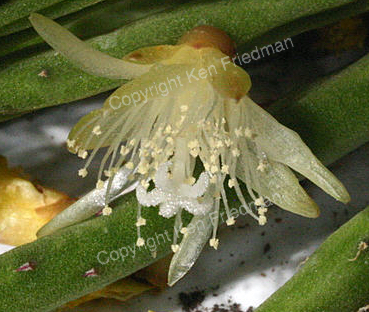 Rhipsalis lindbergiana K.Schumann in Martius, Fl. Bras. 4(2): 271. 1890. 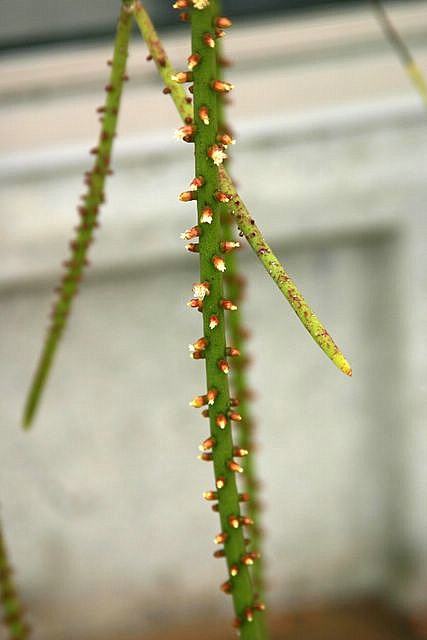 Joints strongly dichotomously branching, stronger than in Rhipsalis cassyta, in age strictly cylindrical, thickened towards the joints, new tips narrow, clearly grooved. Scales very wide triangular, blunt, edges with very small persistent hairs and often exposed beneath the flowers, fleshy. Spines mostly 2, exceeding the scales doubly or almost doubly, curved, tubular, the second one shorter than the first. Flowering on juvenile joints from areoles very close together, single, small, from the base of the spines and supported by tomentum. Ovary sunken, drawn close together, globose, glabrous, naked. Parietal placentation strongly prominent below 3-4 locules. Tepals 4, small triangular, slightly acute, fleshy, membranaceous from middle to tip, oblong, blunt, twice exceeding the ovary. Stamens many, a third shorter than the tepals. Fruit with small soft hairs, somewhat rigid, fleshy, crowned with withering and persistent tepals, more than usual number of seeds. 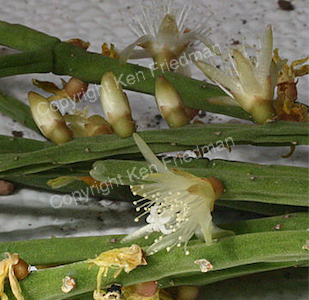 Rhipsalis cassytha G. v. Beck, Itin. princ. S. – Coburg. t. II. 13. non Gartn. Stems up to 2m long or more, branching from the axilles, hanging from tall trees. Joints 8-12 ,(4 – 16, rarely to 20)cm long, younger ones 4-5, older ones up to 6-7mm diam, when dry dark grey, by no means greenish or pale. Areoles 4-6mm apart, 1-1.5mm diam. Spines larger ones up to 2, smaller ones to 1.5mm long. Flowers almost from all areoles, bursting out, especially in younger joints. Pericarp sitting upon a wide ovary. Tepals lowest ones 4, slightly fleshy, 0.3 – 0.8 mm long, next 3-4mm long and 1mm or a little wider, probable white or whitish. Stamens 1.5 to 2.5mm long, filament attenuate towards the tip, whitish hyaline, anthers with very small 2 lobes. Fruit turning reddish white, 2mm diam, 16-20 seeds. Seeds turning reddish (Mature? later probably black) 0.6mm long, 0.4mm diam. Observation I. The plant that G. v. Beck falsely linked to Rh. cassyta Gartn.differs from all species in the genus with tubular joints by having grooves evident between the areoles. Flowers are distinguished from the former by being small and stigmata very small and not at all spreading. It is held that the grooved joints place it intermediate between Angulatas and Teretes, with which it largely agrees rather than with the former. Observation II. This species is named after the honourable A G Lindberg etc etc.